Despite being number one in the Charity Brand Index in 2013, outside of the UK we are practically unknown. However, a quarter of the visitors to our website and nearly a third of our online community of people log on from beyond our shores. Macmillan proposed the brief for these Young Lions Print finalists on a beautiful Saturday, to enthusiastic teams of over 80 young creatives from across the world in the basement of the Palais. I spent an hour talking to the teams about Macmillan, cancer and the changing experience and needs of cancer patients and their families, as well as introducing them to Macmillan’s brand. I then presented our brief for them to create a print ad to raise awareness of the high-quality cancer information available on our website and of our vibrant online community of people supporting each other through their experiences. The primary objective was to raise awareness of these services internationally and to grow our audiences in priority markets: US, Canada, Australia and to other English speakers worldwide. My presentation and questions finished around 6pm and the deadline for the work to be submitted was 8pm the next evening – just over a day to produce finished work! From early Sunday they would each have access to a design station with Macs, loaded with our brand guidelines and assets such as our unique font and Getty images. They disappeared to spend the evening brainstorming and discussing ideas – some of them, I discovered, scarcely slept. The next morning, leaving the sun behind again, I took my croissant to the basement where the teams were already hard at work. I wandered around answering their questions – could they play with our logo? What did people talk about on our online community? I was impressed by their immediate grasp of cancer issues and Macmillan’s brand and corporate challenges. The adverts started to roll off the printer from late afternoon, most just hitting deadline, and were mounted immediately – an eclectic mix of the shocking and the funny, the bold and the mundane. The next morning the Cannes Lions Print Jury were given an introduction to the brief then spent an hour viewing and debating the entries while the contestants milled around outside the jury room. As the ‘client’, we got to keep the intellectual property rights of the ideas produced in response to the brief during the Festival and use them in our marketing campaigns. The Gold Award was presented to Abraham Dario Rodriguez and Luis Felipe Hernandez from DDB Mexico whose ad showed a Google map with its familiar red location bubble – in this case at a MacDonald’s – indicating that there is ‘cancer support here’, a simple and effective way to show that our online support community is always available, wherever you are. 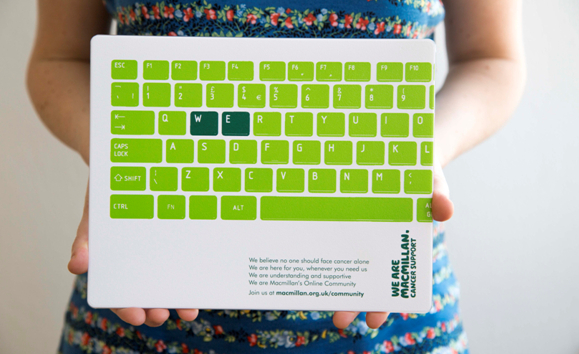 My favourite entry was by Matt Roach and David Lawrie of M&C Saatchi in the UK, a computer keyboard with the letters ‘WE’ highlighted. It effectively represented our brand, our community and its access point in one simple image. My own team also loved it and, back in London, we have reproduced the design on mouse mats. Perhaps it is not surprising the British team understood our brand best as they have been exposed to it much more than any of the other finalists. The aim was always to see work we could really use. Challenging the Young Lions and spending three days at this inspirational Festival was an amazing opportunity for me as well as for Macmillan. It provided insight into how an issue and brand so familiar to me appears to new audiences, stretching the possibilities of how it could be presented. My advice to any other charities lucky enough to be chosen is to ensure the brief is simple but relevant to all the finalists and to engage with them in the development of their entries. The total cost to Macmillan of hotel, flight and train from Nice (the festival entry price was covered by Cannes Lions) was about £800 which is fantastic value for the exposure, experience and learning. The one mistake I made was returning to England as soon as our competition was over, early in the festival. Stay for as long as you can because you’ll be exposed to more technological innovation, more marketing ingenuity, more debate and presentations from the creative stars of the advertising – and non-advertising – industry than you can ever imagine.